The smart way to learn Microsoft Office--one step at a time! The second edition of this popular book features new and expanded content. In addition to covering familiar Microsoft Office applications such as Microsoft Office AccessTM 2007, Excel® 2007, Outlook® 2007, PowerPoint® 2007, and Word 2007--you now also get coverage of Microsoft Office Publisher 2007, SharePoint® Server 2007, Groove® 2007, OneNote® 2007, and InfoPath® 2007. 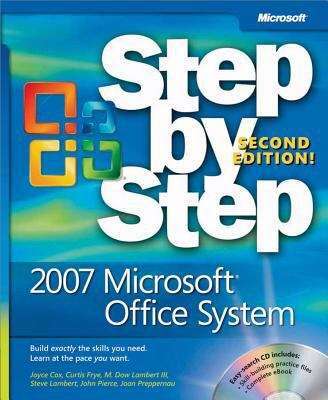 Work at your own pace through the easy numbered steps, practice files on CD, helpful hints, and troubleshooting help to learn the fundamentals of working with the 2007 Microsoft Office system, including how to navigate the new user interface. Learn how to create professional-quality documents, powerful spreadsheets, and compelling slide presentations. And discover how to get your Web site up and running, take notes electronically, and manage your e-mail communications and workday. The companion CD includes skill-building practice files, eBooks, and more. With STEP BY STEP, you can take just the lessons you need or work from cover to cover. Either way, you drive the instruction--building and practicing the skills you need, just when you need them! A Note Regarding the CD or DVD The print version of this book ships with a CD or DVD. For those customers purchasing one of the digital formats in which this book is available, we are pleased to offer the CD/DVD content as a free download via OReilly Medias Digital Distribution services. To download this content, please visit OReillys web site, search for the title of this book to find its catalog page, and click on the link below the cover image (Examples, Companion Content, or Practice Files). Note that while we provide as much of the media content as we are able via free download, we are sometimes limited by licensing restrictions. Please direct any questions or concerns to booktech@oreilly.com.